Nestling your nose into a bouquet of flowers, you can enjoy not only the beauty of the flowers, but their delicate olfactory notes. Flowers 100 million years ago looked very different than they do today—they did not have colorful petals then. However, new research shows that looks aren’t everything and these ancient plants still produced attractive scents. A father-son duo (an entomologist at Oregon State University, George Poinar Jr. and his son Greg, a fragrance collector) examined ancient flowers that have been preserved in Burmese amber for millions of years. Although they don’t have a scent anymore, tissues that are known produce the scents are still present in the fossilized flowers. Therefore, the relevant tissues and flower-based aromatic compounds have been around since the mid-Cretaceous period. 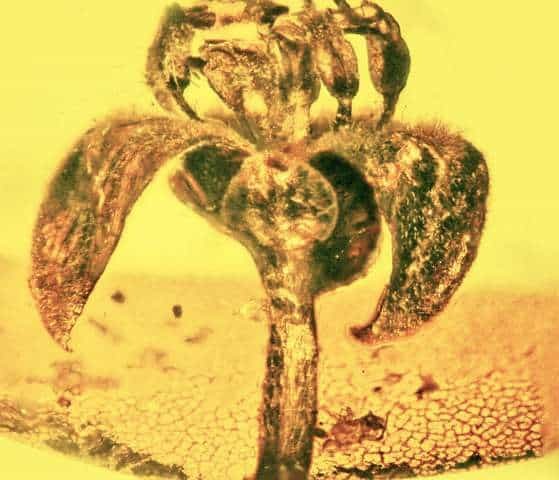 An ancient flower preserved in amber. Image credits: Oregon State University. Indeed, scent was even more important for these ancient flowers because they didn’t have any flashy flower petals that could aid in attracting pollinators. So they needed to smell very attractive. In one respect, these ancient flowers are not so far removed from modern-day flowers. The tissue that secreted the fragrances is very similar to the tissue found in modern plants. Perhaps, then, they also produced similar fragrances to today’s flowers. Who knows, maybe even a dinosaur enjoyed a whiff of a prehistoric flower every now and then.